To get the highest score on Zacky's Quest, you need to have the most lives. To get more lives, you have to accumulate 50 vegetables. So, let me give you the route to take through the maze that will maximize the number of vegetables you can get in the shortest amount of time. First, let me give you some terminology. There are 20 levels to complete the game, but essentially there are 4 different levels (that I am going to call "Venues", and each venue has 2 screens. You have to go through each venue 5 times to get to the next venue. So, Venue 1 is Levels 1-5, Venue 2 is 6-10, Venue 3 is 11-15 and Venue 4 is 16-20. This game is about repetition and timing. When you play the game enough, you can see that even the log and roving bird movements are not random, but there are 3 or 4 patterns that they engage in. Recognizing that can help get you through the levels quicker - but even not seeing what pattern is on the screen won’t prevent you from getting through the game. There are a few general guidelines that you should adhere to throughout the game. 1. Logs. With the logs, when you are moving from one to the next, only do one at a time - then take a moment to make sure you are ready to make the next movement. This is for a couple of reasons. First, the logs are probably the easiest place to die in the screen, so taking extra care there is worthwhile. Second is because sometimes you will jump Zacky to a point on a log where you think he is going to land on the right hand spot of the log, but when he gets there, he shifts to the left. So, taking one jump at a time gives you a chance to recognize this glitch. Also, when you are on the logs try to limit lateral movement on the logs. This is part of the same glitch. Some times, you might be on the right hand spot on the log, and you try to move to the left hand one, and when you make one move to the left, the game actually jumps you two. This is not random - meaning that with practice, you can find exactly which logs you can move left or right. Still, you should try to limit it (there are only two places that I move laterally on the logs. The other thing about the logs is that before you jump on one, check to see if there are any birds flying in your direction that could pull you off. If you think one is coming, you should not get on the log. 2. Birds. Speaking of birds, when where you will enter the second screen of each of the venues, you might have roaming birds coming in the path you want to take. If this is the case, you should quickly back out of the screen and then back in it. The time it takes to do that is minimal, and will save you time that you would otherwise spend trying to avoid the bird. As you play, keep an eye on the bird paths that get in your way, and don’t be afraid to back out until you get a favorable bird path. Also, one of the keys to the game is the perched birds that come at you when you enter their radius. The routes that I take account for the perched birds. Essentially, the bird will head in the direction that you entered his area and then will return to his perch. Knowing how to lure the birds out is helpful in Venues 2, 3 and 4. 3. Bullies. With the bullies, they all walk in predictable patterns. It might take a little bit of study to see their patterns, and you just have to wait until they have passed you (or in some cases, get in behind them and follow them). I thought about putting the bullies’ paths on the screenshots, but that would take a lot more time (maybe later). 4. "Starting" the level. 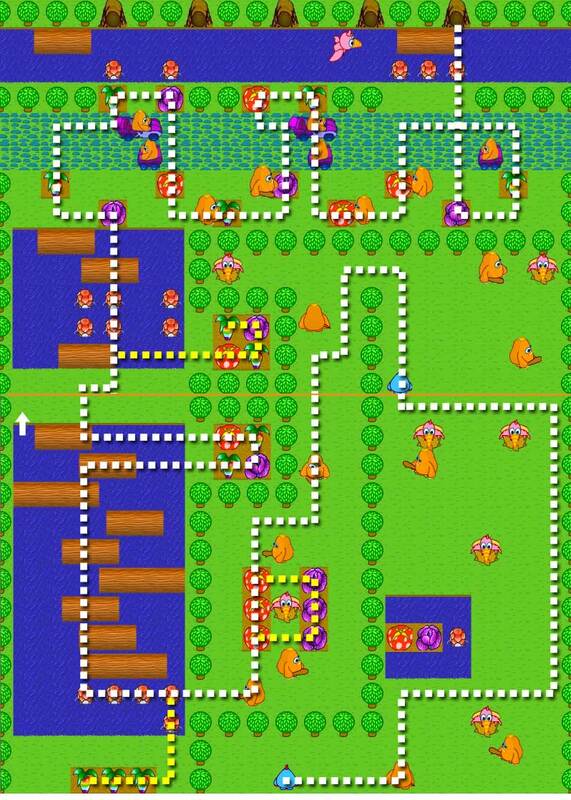 On some of the levels, you can start the level right away (by pressing the up arrow) or, you can wait a few seconds as the logs or cars are moving in front of you. This is something you can note as you are looking at saving time (particularly on the 5th iteration of each level). Ok. Here are screenshots of each of the levels and the routes I take to get through each. It is obviously not possible to show the direct paths that go through the cars or logs, but I have indicated the general area I am in when I make the leaps. One more thing. There are obviously other ways you can go, but the key is that you get a path down and you stick with it, so that each time you work through the level, you are staying consistent. On this first level, I normally cross in the left - center, as indicated on the screen. Then, I get the 6 vegetables on the left, before crossing in front of the bully in the center and getting the 4 on the right. I cross through the cars where I have indicated, because that sets me up for the next screen. On this screen, you can see that I get the 6 vegetables on the right first, and then move to the ones on the left (with the water around them). The reason that I take the roundabout way to get the ones on the right is that it is easiest on the keyboard to go up, right, down, left in the manner shown. Then, I can keep going straight to the turtle. I can normally get to the turtle at the time that it is coming up, and can get the 4 vegetables on the island before the top one goes down. This takes practice and timing. Then, I cross around the point that I have indicated and usually fill the top spots from the right to the left (getting in behind the top bullies as they move from left to right). The key to the logs is to not jump on the ones in row 2 or 3 until you see the one that you are going to go to above. For the most part, on this level, I don’t really have any problem with the roaming bird. Occasionally, when I am on the log, I will notice that my path could intersect with the bird, so I try to avoid that if possible by jumping back to the row below. On the 2nd level, first screen, there is a point where the gap in the middle will open up as shown, and I just jump straight forward (in fact, I don’t "start" this level until it is about to happen). Then, I go straight forward and sneak in between the bullies (or you could wait for the bottom one to pass to the left. Don’t get on the bottom log unless it is going left (if it goes right, the perched bird will come after you). Again, only jump to one log at a time (give a moment in between jumps just to be sure. There is no reason to rush the log jumps and lose a life here. Once you get off the log, you can get the 4 vegetables. You have to be careful with the perched bird - but with some quick fingers, you can move in the path indicated and get them. It takes practice. If you can’t do it, then you can skip these. On the next screen, this is the first time that I look for the roaming, flying bird. This screen capture does not show him flying in a place that I would back down, so I will just have to describe it. 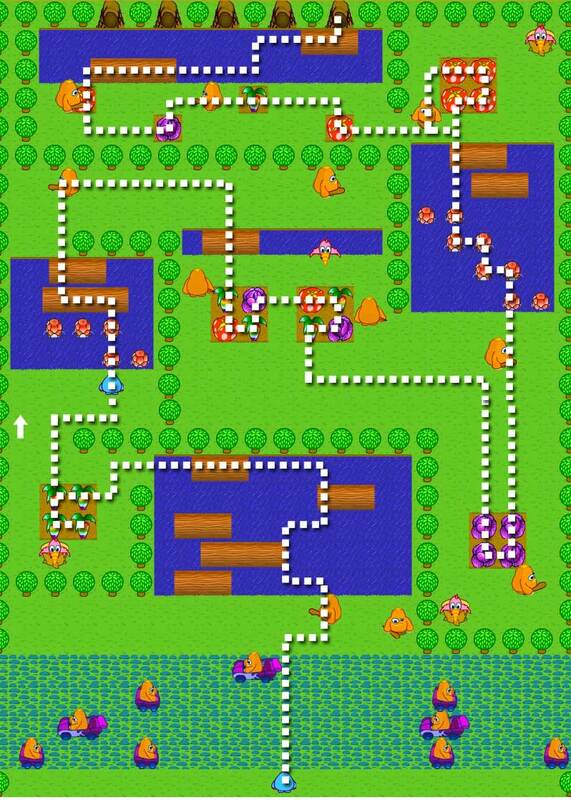 There is one route that he takes that he flies diagonally from the top right to the middle left, and will intersect your course on the left hand logs. That is about the only place that he really bothers me (although sometimes he might be flying around when I am getting into the top spots). You can see the path I take to get the 8 vegetables, and then work toward the right hand side. In this manner, I normally go back down and get the 4 vegetables back on the first screen of this level (as indicated in this and the previous screenshot). When I come back up into this level, I wait for that bottom bully to pass and get right in behind him and cross the turtles as directed. There are sometimes that I will cross straight up the bottom left turtle (and this is one place where the flying bird might be heading straight down the right hand side - to beat this, just cross on the left turtle and move across as noted). When I get off the log, I head to the left of the 4 vegetables and entered the top left one, quickly moving around the 4 in the up, right, down, left manner as I indicated before. If done quickly, this the perched bird will not be a problem. Again, you can skip this step until you have practiced it thoroughly. Getting the last vegetables and through the logs might be a little more random (depending on how long it takes you to get there), but generally speaking, I get all of the vegetables, and get the top spots from the right to the left (although sometimes, the logs will present better opportunities to get one on the left first - so, in that case, I just get the quickest one first). On level 3, the movements look a little tricky, but that is to draw the perched birds out so that you can get the vegetables. Again, this takes practice and a little bit of timing. By moving as I have indicated (2 bounces left and then 2 up), the 3 birds on the left come fly to that point. They will not be able to get you, though. Then, come back down and follow the bottom bully. Getting the 2 vegetables in the center might be hard, but with practice, you can get the timing down. As far as getting through the cars, it takes a little bit of skill and some quick fingers. I am normally able to get to the third row of cars and follow that one to the middle, where I cross. Which turtle you cross on depends on how long it takes you to get up there. It almost doesn’t matter which one you cross, but I recommend choosing one and always cross at that one (repetition and decisiveness is the key). I get the 2 vegetables on the top and move on in the center as indicated. The next screen also looks complicated. If you are not interested in getting the vegetables, it is very easy to move straight up and hop in the top spots without any problems, but the path I give, gets the most vegetables. Also, not depicted here, is that I also go back down to get the missing vegetables on the first screen when I am in that area. I didn’t show that here, because it can be more complicated and time consuming (and more possible to get killed). Just know that when you are getting the groups of 4 vegetables on the bottom left and right, you can also drop back down and get the ones on the first screen. Here is another screen that I watch for the flying birds when I first get on the screen. 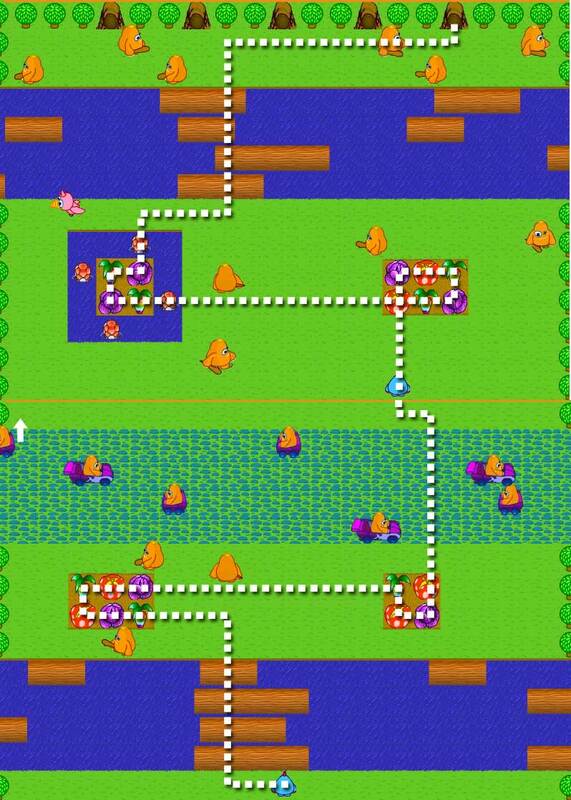 There is one route where the bird flies right toward the middle 4 vegetables. If I see that, I just go back down and up again to reset the screen. Moving across the logs you have to watch for the birds. Just be patient and don’t be afraid to go back down the logs to avoid a bird. I usually hop into the holes from the outside in (get the one on the far right first, then the far left, then second from the right and so on). This is because of time constraints on the 5th iteration of this level. Finally, to the last level. On this one, it took me a bit to get through the first set of bullies and perched bird, but after a few times, I got the path that I have there (and never die getting through this. I work my way quickly up the right hand side, drawing the birds out, but if you move quickly enough, you will not have any problems. I completely ignore the 2 vegetables in the center, because in the grand scheme of things, those don’t get me enough for an extra life (and the chance of dying getting them is fairly high). I take that swing across the top only because it makes the timing on the next screen work out. If you do enter the next screen from the top right (keep going straight up the right side), do not come back down, or else that top bird will drag you away. As you enter the final screen, I make the move show, always entering back to the bottom screen where I have indicated (again, to avoid the perched bird). 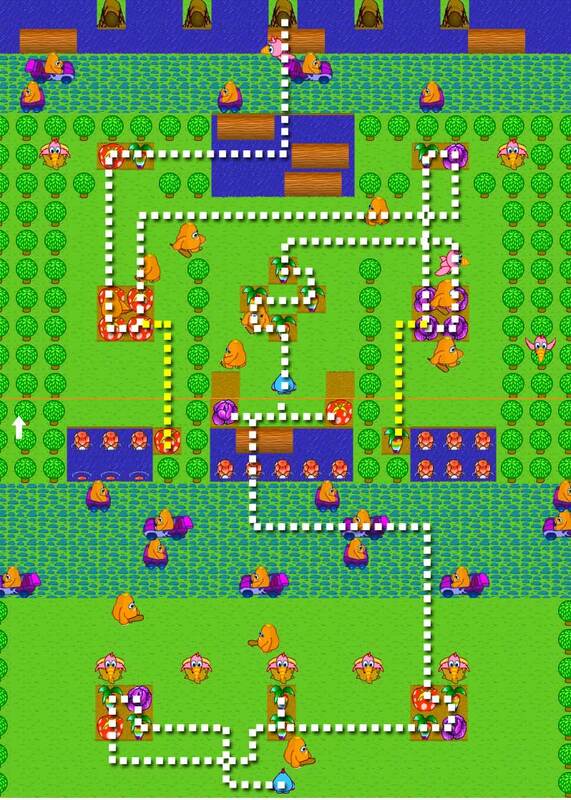 Now, going back to the first screen of this level, I work around the bullies and birds as indicated. The yellow path is an optional path (that takes real skill and timing to do to avoid getting killed by the bird or the bullies). As you jump across the turtles, you have the option to get the bottom three vegetables if you have time. Ultimately, they add up (the 3 there add to 15, and the other 3 add to another 15 - which is 30 in all, so if you get 50, you get an extra life (which can translate to 1250 points at the end)). Jumping across the logs takes patience. Again, just jump one log at a time. Getting the top vegetables is also optional (it can be 20 vegetables if you get them for all 5 iterations). Back to the final screen. Again, I watch for the roaming bird and if he is coming down to where I am, I will back out and reenter the screen until I get a path that will not interfere with my progress across the logs and turtle. You can optionally get the other 4 vegetables (again, 20 total if you get them for all 5 iterations). When you wait for the log to come back to you, you should wait where the red vegetable is (in order to draw the bird straight down). When the bird comes at you, you can side step him to the left. Finally, getting all of the top vegetables takes a lot of practice, patience, timing and skill. At first, don’t try to get them all, but as you get better and better, try to get a few more each time, perfecting your paths. Typically, I fill in the spots from the right to the left, because of my repetitive pattern (and the fact that the far right one is the hardest to get. To get that, you just have to monitor the timing of the turtles and don’t jump on the turtle unless you are sure you will be able to quickly jump into the hole. Ok. Here is a summary of the points. On level 1-5, you can get 20 vegetables per level, with a total of 100. This will give you 2 extra Zacky’s. On level 6-10, you can get 24 vegetables, with a total of 120. This will give you 2 extra Zacky’s, plus 20 on the next one. On level 11-15, you can get up to 30 vegetables per level, with a total of 150. This will give you 3 extra Zacky’s (plus the 20 left over from before). On level 16-20, you can get 32 vegetables per level - although I hardly ever get those 2), which is 160 for the 5 levels. One of the reasons I don’t get the 2 is that I would have 30 extra at the end if I did - so I figured that I can save time by not getting a total of 30 (and still getting the maximum amount of extra lives. So, you can get a total of 3 extra lives here. This adds up to 10 total extra lives that you can get (in addition to the 3 that you start with).